Anyone heard it, what are your thoughts? Sorry I can't help you, never heard it! But do you have a link to that playback? You're lucky you have a classical station that plays anything off the beaten path. On a side note, Rossini wrote a Miserere that was just re-discovered not too long ago, but I've only been able to identify one recording of it, and that doesn't seem to be for sale anywhere. sounds interesting too. http://www.coromonteverdi.it/pubblicazioni/cd-02.htm Composed probably around the years 1810-1813 in Venice, the “Miserere” is one of the few compositions of the Pesarese Maestro for male choir and instruments. "Unknown for many years and rediscovered only in recent times, the “Miserere” is a composition of the young Rossini, but it is not superficial and naïve. On the other hand, in this piece, the composer is experimenting those harmonic, vocal and instrumental solutions which will later become his personal style in his Operas. The piece counts on the presence of a group of strings (violin I, viola II, cello and contrabass) to which is added a group of wind instruments (oboes, horns) and a choir of tenors I and II, basses and three male soloists. The choir and the soloists sing alternating themselves throughout the seven parts in which the composer divided the Psalm 50 text." The Miserere sounds intriguing Joan, I'll have to keep my eyes peeled. 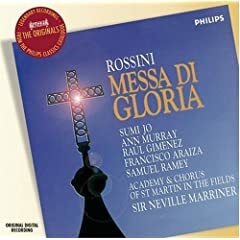 I like Rossini's operas but until I heard that bit of the Messa di Gloria I hadn't even realised he wrote anything else! Unfortunately I don't have a sound file. You're lucky you have a classical station that plays anything off the beaten path. Yes, we only have one classical station out here, but I like it a lot. You can check it out for yourself at http://www.abc.net.au/classic/audio/ - click on "Listen Now" for streaming, or "Listen Again" for selected programs. I bought some years ago a CD, from a minor label, which contained a Kyrie by Rossini, apparently composed during his youth. Even if a bit too "operatic", I consider it as a very beautiful composition (it had a remarkable tenor solo section, which I remember to be very well sung, but the recording was technically poor). It seems that besides his operas, we can find in Rossini's production a group of religious works (among them, for sure, the Petite Messe Solennelle and the Stabat Mater) that should be seriously considered for building a complete image of the composer.